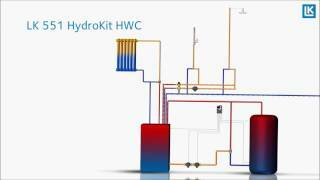 LK 551 HydroKit HWC is a compact unit for hot water circulation. Hot water circulation offers instantly available hot water at a tap, so you don´t have to wait on hot water. Hot water circulation is especially useful in buildings with long water pipes. LK 551 HydroKit HWC consists of a mixing valve, cross, connection kit and 3 check valves, to prevent self circulation. The mixing valve has a thermostat that regulates the supply of both cold and hot water to the desired temperature. The valve has an anti-scald function that closes for incoming hot water in case the cold water supply ends.